All the Pokemon Dawn Ever Owned! At first, Dawn's Piplup didn't behave too well until Dawn finally earned its trust by saving it from Ariados and watching Mespirit emerge from a lake. Dawn caught Buizel after trying twice to catch this strong Pokemon. Soon Dawn traded Buizel to Ash, because Buizel had more interest in gym battles that Pokemon Contests. After Dawn caught Pachirisu, she thought about releasing it, but soon decided to recapture it and suceeded after some trouble with Team Rocket's Jessie. 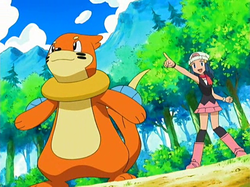 Eventually, Dawn traded her Buizel for Ash's Aimpom, because Buizel was more in to normal battles and Aipom prefered Pokemon contests over ordinary battles.